The cordless drill driver is characterized by its ergonomic design and high level of operator convenience. It obtains its power from a 10.8 V lithium-ion battery, which guarantees a long service life. High level of operator convenience - Powerful, light-weight drill driver due to balanced design. 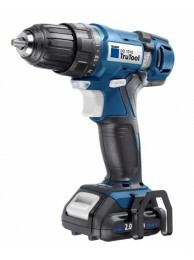 Powerful 2-speed transmission - With the high-quality drill driver, you can achieve torques of 11 or 15 foot pounds. Diverse area of application - Ideal for start holes, for drilling and screwing. Compatibility - Rechargeable battery and charger are the same as the current TRUMPF 10.8 V Li-ion battery machines. Powerful and user-friendly operation. The high-quality TruTool DD 1010 is equipped with two speeds..